These databases are by far more comprehensive than the Canadian Earth Impact Database which has time and time again got talked about not so much because of its set of criteria as because of its application frequently inexplicable. The Canadian database seems to have lost its former reliability and we can’t help thinking that personal connections take precedence over scientific significance. This becomes especially evident with regard to the large Spanish Azuara and Rubielos de la Cérida impact structures which are still disqualified from the Earth Impact Data Base at the University of New Brunswick (Canada) managed by John Spray. Characteristic of John Spray’s odd understanding of science: In a written inquiry Ferran Claudin asked him why the Azuara structure formerly established as a proven impact had been eliminated from the data base and why also Rubielos de la Cérida despite overwhelming impact evidence has not been recorded. Moreover, Ferran offered to send him reprints of all published articles on the impacts. John Spray wrote back that Ferran were free to do it but that he, John Spray, would not read the articles. Many a time when people are thinking of “science” they are opining that scientific knowledge is something like the incarnation of superiority on human interests. They must then be reminded that in actual fact the scientific cognition is a human creation – and is thus related with human glory and human misery. A person or persons who are changing or are intending to change the traditional view are in general initially ignored, then insulted and finally, if all this doesn’t help, they become attacked by parts of the “ruling class” (in other words by the owners of the “incarnation of wisdom” – from the viewpoint of the dominant group). By this means scientists or groups of scientist can be tackled by the “ruling class” in many different ways in order to maintain the “truth” (in accordance with the view of Barnes (1977)), such as: ostracism, excessive examination their work (by, e.g., willing reviewers), obstruction und rejection of work, retarding of help and resources, redeployment, prevention of publications, formal rebukes and censures, rumormongering …. Quite a few examples for the suppression of dissenters to be found in various fields of science can be studied on the website of Brian Martin: (http://www.bmartin.cc/pubs/supp.html ). 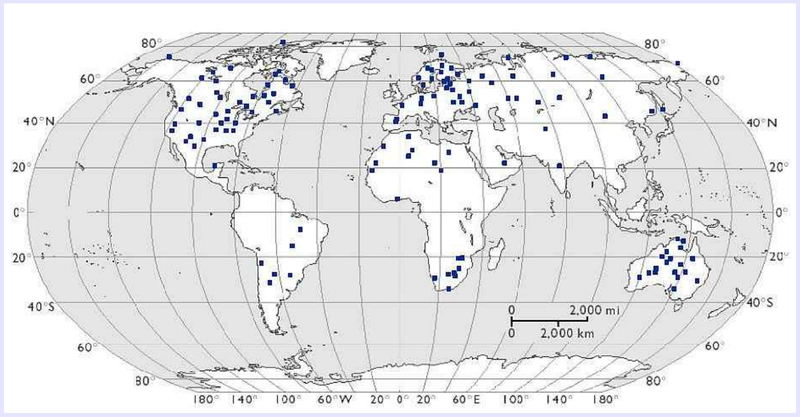 World map of important impact structures and meteorite craters.